October 17-25: Free Ahmad Sa’adat and Georges Abdallah! End the denial of family visits! On September 14, Ahmad Sa’adat, imprisoned Palestinian leader and General Secretary of the Popular Front for the Liberation of Palestine, was denied family visits for a period of three months by occupation prison authorities. This action comes amid the denial of family visits to hundreds of Palestinian political prisoners at the whim of Israeli occupation officials since June of this year. The denial of family visits is not only intended to isolate Palestinian prisoners from all connections to their families, communities and the world outside prison, but also to collectively punish Palestinian families by denying them access to their imprisoned loved ones. 40% of Palestinian men in the West Bank and Gaza have been held in occupation prisons. Today, there are over 7000 Palestinians detained in Israeli jails, nearly 2000 of them imprisoned in mass arrests since June. 500 Palestinians are held under administrative detention, without charge or trial, while 1500 Palestinian prisoners are sick and denied adequate medical care – and over 100 of them are critically ill with cancer and other serious disease. Since June of this year, the Israeli state has escalated its attacks on Palestinian prisoners: in addition to the denial of hundreds of family visits, both by orders banning visits directed at prisoners and ‘security’ exclusion orders directed at family members. Some prisoners have not seen their family members in years. This comes in addition to violent raids on prisoners’ rooms and sections, confiscation of belongings, denial of access to the canteen, and frequent transfers of prisoners from one prison to another. These attacks are aimed at isolating Palestinian prisoners from the Palestinian people – and from the eyes and the conscience of the world. The Campaign to Free Ahmad Sa’adat urges those who stand in solidarity with Palestine around the world to take action to highlight the struggle of Palestinian prisoners for justice and freedom, and demand an end to the practice of denial of family visits during October 17-25. These days also include October 24, the 30th anniversary of the imprisonment of Arab struggler for Palestine, Georges Ibrahim Abdallah, in French prisons. Abdallah, a Lebanese Communist whose trial was ridden with irregularities, has been granted parole on multiple occasions, each time denied at the highest levels of the French government under US and Israeli pressure. Events and actions are being organized in France and elsewhere to demand Abdallah’s release. On October 17-25, please take action for Ahmad Sa’adat, Georges Ibrahim Abdallah, and all of the Palestinian and Arab political prisoners in occupation jails – and under oppression and behind bars around the world. 1. Hold a protest at Israeli consulates and embassies demanding justice for Palestinian prisoners and an end to the denial of family visits. Find Israeli consulates in your city here. 2. Download and distribute this leaflet on the case of Ahmad Sa’adat and Georges Ibrahim Abdallah. 3. Protest at French embassies and consulates on October 24-25 and demand the release of Georges Ibrahim Abdallah. Find French consulates in your area here. 4. 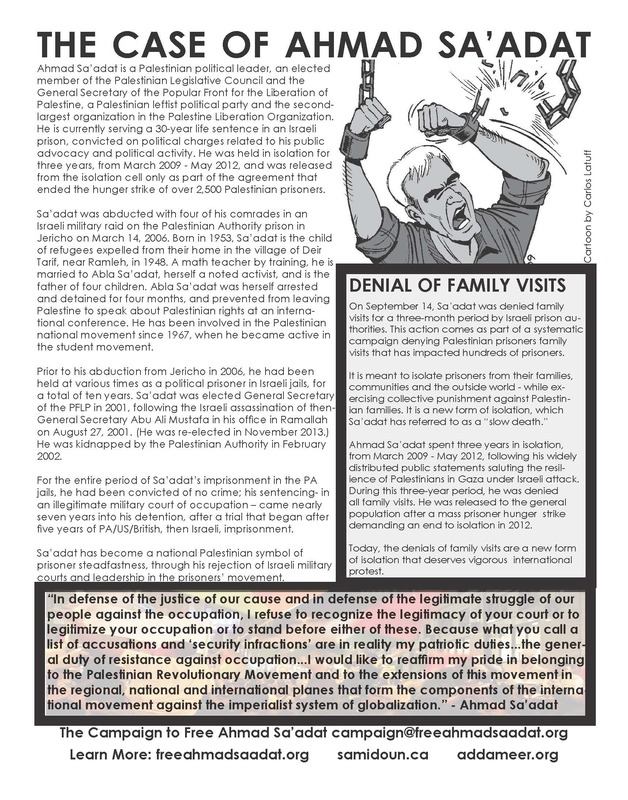 Join an online action demanding an end to the denial of family visits to Palestinian prisoners. Via Samidoun. 5. Email us about your actions for Ahmad Sa’adat, Georges Ibrahim Abdallah, and Palestinian prisoners! Contact us at campaign@freeahmadsaadat.org or use the form below. 6. Boycott, Divest and Sanction! Palestinians have called for an international boycott of Israel until it ends its apartheid policies and violation of Palestinian rights. Boycott products like Hewlett-Packard, Ahava and SodaStream, and demand divestment from companies like G4S, who provide security services to Israeli prisons. Learn more about the campaign at bdsmovement.net.